"Go on, take the Dunkin' and run." That's how that classic Steve Miller Band song goes, right? At least that's how we feel on hectic Monday mornings when we're hitting up that Dunkin' Donuts drive-thru to get our iced coffee and glazed doughnut. And just for us constantly-on-the-go types, Dunkin' has launched its new Dunkin' Run value menu — and, no, it doesn't solely consist of breakfast items. The menu features a cast of $2 items, including ham and cheese rollups, pretzel bites with mustard and waffle-battered chicken tenders. 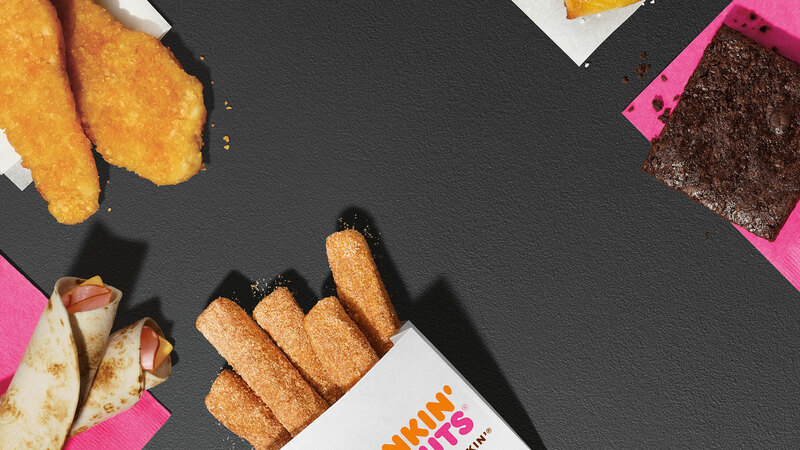 But the two we're most excited about are the return of Donut Fries and Dunkin's first-ever nationwide gluten-free bakery product: the fudge brownie. Introduced back in April, the Donut Fries are buttery croissants, deep-fried and sprinkled with cinnamon sugar. Who needs Taco Bell's nacho fries when you can have these glorious, crispy doughnut fries? Actually, no, don't answer that, Bell-heads. "We know that the 'Dunkin' Run' is a daily part of many of our guests' lives as they keep themselves and their friends running, so we're excited to launch a new menu offering fresh ways to satisfy any craving any time of day," says Dunkin' Donuts' U.S. chief marketing officer Tony Weisman in a press release. "We also recognize the importance of providing alternative choices for people with dietary restrictions or who choose a gluten-free diet, which is why we're pleased our new menu offers guests a gluten-free fudge brownie, which is so chewy and delicious we think everyone will love it." According to Dunkin' Donuts' press release, the menu was created to pair perfectly with their signature beverages, including their iced coffees and teas. And for $2 each, you get a pretty sizeable amount of food: two orders of ham and cheese rollups, five bite-size pretzels with a side of spicy brown mustard and two chicken tenders coated in waffle batter. Also returning to the menu is the s'mores doughnut, perfect to round out your summer. And who can resist a chocolate icing-frosted doughnut filled with marshmallow and sprinkled with graham crackers and Hershey's chocolate? See y'all in the DD drive-thru. We'll take one of everything.